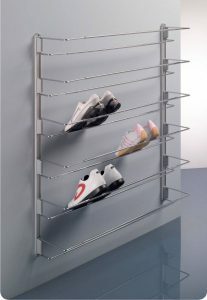 Shoe-rack is a metal frame which can be fixed onto the wall or inside furniture thus turning space which is usually wasted into shoe-racks. Ideal for use in cupboards, cloakrooms and built-in wardrobes. With the aluminium guide, six Shoe Hangers can be used in adjustable heights with just four screws fo attach them to the wall.